While most games featuring ninjas (with the previous exception the Tenchu series) are about over the top action such as the Ninja Gaiden series. The original mythos behind one half of the always debated “pirates vs. ninjas” argument were about how powerful being hidden can be. Mark of The Ninja leans more towards that interpretation with an old school vs. new school story line. The game begins with the main character waking up to find his ninja village attacked by a military company and is forced to defend his home and seek revenge on the group. Aiding him is the titled “mark of the ninja”: a tattoo made with special ink that grants the wearer extraordinary abilities at the eventual cost of their sanity. The first element that Mark of the Ninja gets right about stealth design is power, specifically: How strong should the player be? If the player is too strong they may just forgo stealth and turn the game into a generic action title. Or if the stealth is too easy, then the game becomes a slow boring slog to the finish line. However, if the player is too weak then they will find themselves only being able to get through the game using a linear route. Due to any other option would lead to their death, by being completely outmatched by the AI. Mark of the Ninja does an excellent job of making the player feel both incredibly powerful and very vulnerable at the same time. With your sword, you can kill almost every enemy in the game with one hit from behind. And as the game goes on you can upgrade to be able to perform more stealth attacks from different positions. 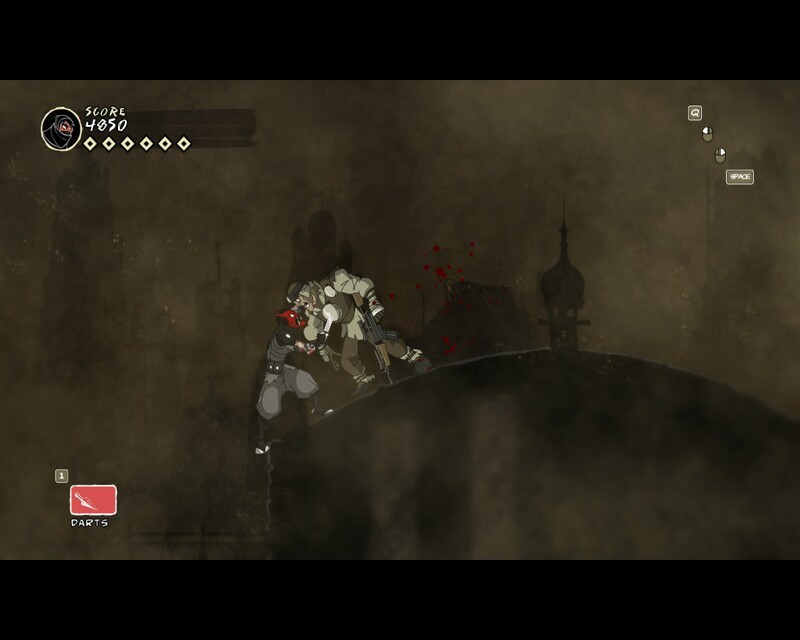 The player can also make use of distraction and attack weapons to get around or deal with enemies respectively. Most of these items can be upgraded as well over the course of the game. Stealth kills are the great decider in the game and are further heighten by the impressive animations. 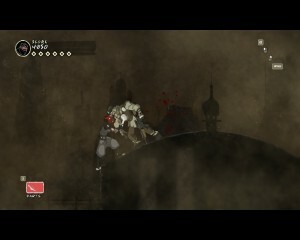 In a one-on-one fight, the player can use the ninja’s agility to take out enemies with ease, even if they are detected. If an enemy spots the player before they get into attack range, they can either finish off or seriously injure the player very fast. The ninja cannot handle multiple enemies at the same time as whoever the player isn’t attacking, will be using their gun on the player. What this system does is that it gives the player plenty of power and options for dealing with enemies, while at the same time allowing the enemies to always be a legitimate threat to the player. Now having the power to deal with enemies is important, but knowing when to strike is vital and where Mark of the Ninja also succeeds at. The other major element of good stealth design is feedback to the player, such as: Is the player hidden? How far can the enemy see? What elements will set the guard off? One of the problems of a lot of stealth games is the lack of feedback. Forcing the player to guess at whether or not they are safe. While this can add tension to the game, it also can lead to the player repeating segments to figure out what are the safe conditions for sneaking around. In Metal Gear Solid 3: Snake Eater, while the designers did a great job of making Snake both a force to be reckon with, but still vulnerable to damage, the stealth feedback wasn’t as good. The player had a “camouflage index” that rated from 0 to 100, with the higher the number the more hidden the player was. However, there was no discernible feedback for the player to base how hidden they were. For example, what is the difference between having an index of 50 vs. 57? 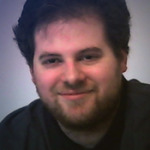 Being a 2D game, Mark of the Ninja’s streamlined view allowed the designers to put in concise indicators for the player to follow. The two systems of detection are light and sound. Whenever the player is not hiding by use of a background object, they are affected by the lighting in the area. If the player is not in direct light then they can get somewhat close to guards without being detected. The only thing they have to watch out for is the guard’s natural vision, represented by a hand held light source. 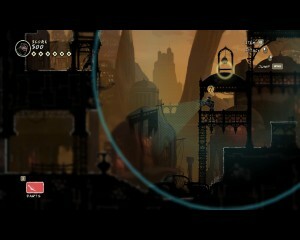 The use of explicit indicators for detection, gives the player an idea of how well they are hidden. But if the player has light shown on them, then a guard can spot them from one to two screens away. Sound is represented by a blue circle that extends out of any noise making source. You’ll see small circles appearing at guard’s feet to let you know if there is movement behind a closed door. 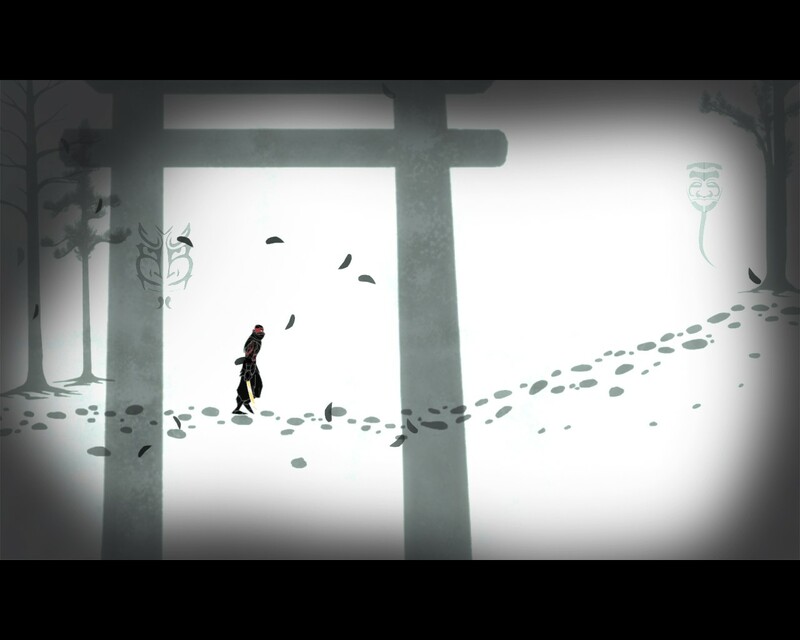 The ninja does not make any noise when walking or jumping, but will if the player decides to run. When you attack an enemy from behind, you have to perform an extra command to finish off the attack. Get it right and the attack goes off without a hitch, mess up and the enemy lets out a death scream that alerts nearby guards. With the set systems of power and detection at play, it frees up the player to go through the levels their way and gave the designers leeway in creating the level design. The levels themselves are constricted enough that you’ll always have an idea of where to go, but open enough for a variety of options. This transforms the levels almost into a free-form puzzle allowing the player to decide how to proceed. You could be a one ninja killing machine, or get through without ever using your weapon on a guard, or anything in between. This freedom is coupled with an excellent scoring and achievement system. In every level of the game, you can earn a possible total of nine upgrade points. Three of which from finding hidden scrolls in the level, another three for reaching certain score thresholds and the last three for completing optional objectives. The points can be used to upgrade your move set or unlock gear that can be used. The beauty of the scoring system is that the game rewards you with points both for going through undetected or performing stealth kills. So you’re never really punished for any tactic that you come up with and the variety of items available allows you to keep changing up your strategy. The other unlocks are various suits that become available through play. These suits are not simple palette swaps and each one provides a major benefit, at a cost. For instance the stealth suit allows you to run without making noise and bring two distraction items per level. However you lose your sword meaning that you can no longer perform stealth kills. There really isn’t a whole lot for me to critique Mark of the Ninja on. The biggest problem I had was that the controls felt a little clunky with a keyboard and mouse setup when it came to transitioning between different elevations or climbing onto sections. The only other fault was that I wanted to play the game more. Mark of the Ninja‘s story is on the short side with replay-ability in the form of getting all upgrade points on each level. The game does come with a new game + option that reduces your health and removes the sound indicators upping the challenge. It should be fitting that a game about ninjas would appear out of nowhere to impress me this much before the end of the year. Mark of The Ninja is an amazing stealth title and proves that sometimes you need a ninja to show how great stealth can be.